X It can’t stop itself from chasing moving things, and it runs in a circle, chasing its own tail. X Es muss Dinge, die sich bewegen, einfach jagen. Es rennt oft im Kreis und jagt seinen eigenen Schweif. X Il poursuit tout ce qui bouge. On le voit parfois courir en cercle, chassant sa propre queue. X No puede evitar ir tras las cosas que se mueven. Hasta corre en círculos persiguiéndose la cola. X Non riesce a evitare di inseguire tutto ciò che si muove e corre in tondo a caccia della propria coda. X 움직이는 것을 무심코 쫓아간다. 자신의 꼬리를 쫓아서 똑같은 장소를 빙글빙글 돈다. Y It shows its cute side by chasing its own tail until it gets dizzy. Y Es zeigt gerne seine niedliche Seite, indem es seinen eigenen Schweif jagt, bis ihm schwindlig wird. Y Un Pokémon très mignon qui aime parfois courir en cercle en chassant sa propre queue. Y Le gusta jugar persiguiéndose la cola hasta que se marea, mostrando así su lado más mono. Y È davvero carino quando barcolla per i giramenti di testa, dopo aver cercato di mordersi la coda. Y 자신의 꼬리를 쫓아서 놀고 있으면 눈이 핑 돌고 마는 귀여운 일면을 보인다. 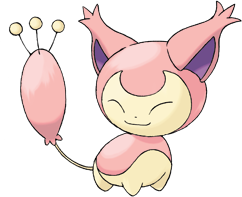 Omega Ruby Skitty is known to chase around playfully after its own tail. In the wild, this Pokémon lives in holes in the trees of forests. It is very popular as a pet because of its adorable looks. Omega Ruby Eneco jagt spielerisch seinen eigenen Schweif. In der Wildnis lebt dieses Pokémon in den Löchern von Bäumen. Es ist als Haustier sehr beliebt, da es bezaubernd aussieht. Omega Ruby On sait que Skitty court souvent après sa queue. À l’état sauvage, ce Pokémon vit dans les cavités des arbres de la forêt. Il est tellement adorable qu’il a un grand succès comme animal de compagnie. Omega Ruby Skitty es conocido por la costumbre que tiene de juguetear y de intentar pillarse la cola. En estado salvaje, habita en las cavidades de los troncos de los árboles del bosque. Es la mascota de muchos por lo dulce que parece. Omega Ruby Skitty è noto per il suo movimento rotatorio inteso a mordere la propria coda. Allo stato brado, vive all’interno di tronchi cavi nella foresta. È molto amato come animale domestico grazie all’aspetto estremamente dolce. Omega Ruby 자신의 꼬리를 쫓아다니는 포켓몬이다. 야생에서는 숲의 나무 구멍에서 산다. 귀염성 있는 얼굴 때문에 애완동물로 인기가 높다. Alpha Sapphire Skitty has the habit of becoming fascinated by moving objects and chasing them around. This Pokémon is known to chase after its own tail and become dizzy. Alpha Sapphire Eneco ist fasziniert von Dingen, die sich bewegen, und jagt ihnen hinterher. Dieses Pokémon jagt häufig seinen eigenen Schweif, sodass ihm schwindlig wird. Alpha Sapphire Skitty a pris l’habitude de pourchasser les objets mobiles qui le fascinent. On sait que ce Pokémon court souvent après sa queue, jusqu’à ce qu’il ait la tête qui tourne. Alpha Sapphire A Skitty le encanta mover cosas e ir detrás de ellas. Es de todos sabido que se dedica a ir detrás de su propia cola y que, al final, acaba mareándose. Alpha Sapphire Skitty ha l’abitudine di lasciarsi ammaliare dagli oggetti in movimento e seguirli dando loro la caccia. Questo Pokémon è noto anche per rincorrere la sua stessa coda fino a rimanere stordito. Alpha Sapphire 움직이는 것을 발견하면 푹 빠져서 뒤쫓아 가는 습성을 지닌 포켓몬이다. 자기 꼬리를 쫓다 현기증을 일으킨다. Ruby Skitty has the habit of becoming fascinated by moving objects and chasing them around. This Pokemon is known to chase after its own tail and becomes dizzy. 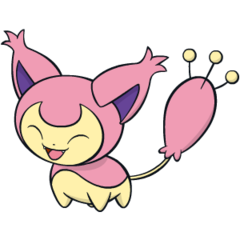 Sapphire SKITTY is known to chase around playfully after its own tail. In the wild, this POKeMON lives in holes in the trees of forests. It is very popular as a pet because of its adorable looks. LeafGreen It is said to be difficult to earn its trust. However, it is extremely popular for its cute looks and behavior. Diamond It can't stop itself from chasing moving things, and it runs in a circle, chasing its own tail. Pearl It can't stop itself from chasing moving things, and it runs in a circle, chasing its own tail. HeartGold It’s adorable when it chases its own tail. It’s difficult to earn its trust. SoulSilver It’s adorable when it chases its own tail. It’s difficult to earn its trust. Black It can't stop itself from chasing moving things, and it runs in a circle, chasing its own tail. White It can't stop itself from chasing moving things, and it runs in a circle, chasing its own tail. White 2 It shows its cute side by chasing its own tail until it gets dizzy.